For Millennia the Moon has been thought to have considerable effect on Life here on Planet Earth, Especially as it relates to humans. Now to some that may seem like some kind esoteric idea or mysticism but it may be more scientific then you think. Considering our bodies are largely made up of water this idea isn't so far fetched. We can see the Lunar Effects on the Tides here on Earth and how powerful they are but that is not the only area affected in my opinion. "So," you may ask, "Why is a guy who invests in the market writing an article about the moon?" Good question! In my research, I have found what appears to be a direct correlation between the primary phases of the moon and the points at which any given, freely-traded market will reverse direction. To say the least, this phenomenon is quite amazing and has nothing to do with astrology and everything to do with astronomy and physics. The cycle of the moon from new moon to new moon is called the synodic cycle. It is 29.5 days in length. This cycle, although invisible, appears to have quite an effect on the markets. I would venture to say: Not only is the moon involved but other planetary bodies in our solar system as well. Think of our Solar System as nothing more than a big Clock. Everything we do here on Earth is based on Cycles. Our method of keeping time and our Calendar is all based on the relationship of the Sun Earth and Moon and how long it takes for the bodies to move a certain distance in a certain time. Even our Seasons change as a result of these relationships. I am not a Scientist or claiming to be one so lets move on to the empirical evidence. It has been my personal observation that specific phases of the moon appear to have a direct effect on when any given freely traded market will reverse direction on a Daily Chart. A reversal, as defined for the purposes of this article, is when the current daily price bar close is below the previous day price bar close when the market is trending up. Or, a reversal is when the market is trending down and the current daily price bar close is above the previous day price bar close. The lunar phases I'm talking about here are the new moon, first quarter, full moon and last quarter. Each time I tested this concept, it worked equally well for each market tested within the defined tolerances I have also outlined here. Another thing to consider is that Market Price moves in a Circle rather than up and down. Consider this, from New Moon to New Moon is 360 Degrees isn't it? Which would mean each Quarter Phase is equivalent to 90 Degrees. 90 Degrees multiplied by 4 gives us 360 Degrees. That is a Cycle isn't it? Take the ephemeres (lunar dates). 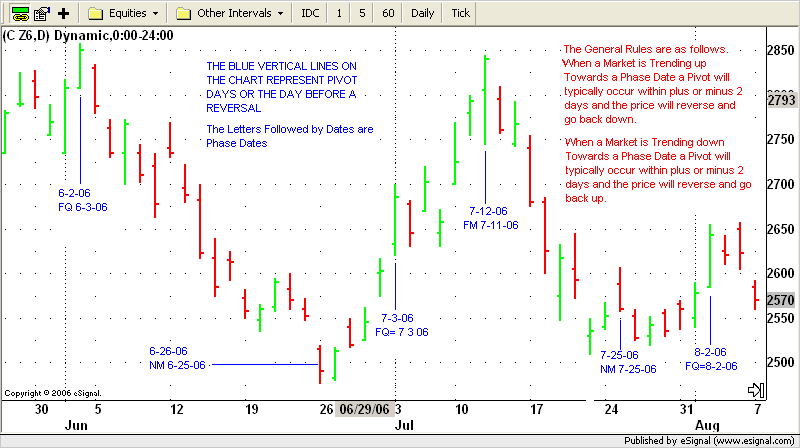 Look at each date listed in the market of your choice, and you will notice pivots occur on or around that day. The pivot day, for purposes of this article, is not the reversal day but the day just before it (also known as the set-up day), which signals the change about to come. I have noticed that pivots generally occur within a tolerance range of -2, -1, 0, 1 or 2 trading days of the specific moon phase date, zero being the actual phase date. A hypothetical example of this would be if the next ephemeral date were August 9, 2006. The pivot day could be anywhere from the 7th to the 11th, the 9th being the zero day or actual lunar date. A smaller percentage of the time, pivots occur within a tolerance of or -3 trading days, so please keep this in mind. I have also noticed that a pivot day can occur on either side of a phase date in the same week. In other words, a pivot day can occur before and / or after a phase date in any given week, creating 2 pivot days in the same week. Please take a look at the Daily Corn Chart for empirical evidence of this phenomena. Note: Holidays and weekends are not considered trading days in most markets. So, when a phase date occurs on Saturday, we use Friday's date. When a phase date occurs on Sunday, we use Monday's date (except when trading Forex because Sunday is an actual trading day in the Forex market). Also, because Forex is a 24-hour market, make sure you know what time the day session officially starts in your time zone to interpret the phase dates properly. When a phase date occurs on a holiday, we use the next trading day as a point of reference. Important Note: Always use GMT for phase dates. Is it possible for a Pivot to occur outside these tolerance ranges? Yes. Nothing is 100% accurate that I know of. Think of any market as a river. A river has life, therefore a rhythm. Once you lock onto the rhythm it is possible to be on the right side of a trade more often then not. In today's markets, traders always seem to be focused on the exact moment in time that a market will turn around, and they also want to know the exact price at which that turn-around will occur. For this reason, the river analogy will be useful. If I want to go up river all I have to do is jump into the river when the tide is going up and that does not require jumping in at the exact moment of change. Of course if you are able to do so all the better for you. I will say discovering the moment a trend will change and the price it will occur at is possible. If you are willing to go beyond what you think you know and apply yourself all things are possible. *Copyright 2006 Reprinted and (Modified) with permission from Vincent Troncone. www.livefuturestrading.com. Futures and options trading involve high risk, and you can lose a lot of money. When investing in futures, you may lose more than your original investment. When purchasing options, you may lose all of the money you invested. According to many experts, most individual investors who trade commodity futures or options lose money. There is a substantial risk of loss in trading futures and options. Do not risk money you cannot afford to lose. Past results are not necessarily indicative of future results. There is no guarantee that the information in this article will generate profits for the reader. All charts are provided by FutureSource.com, a division of eSignal. For more information you may also want to view this YouTube video on moon phase trading. and upcoming moon phases, anytime: QuickPhase Pro.